Apocalypse 4 Real: La Nina Over - El Nino Coming in 2017? La Nina Over - El Nino Coming in 2017? After the massive El Nino ended in 2016, it was speculated that La Nina would follow - and it did. However, it was not a very strong one. Most months it barely met the criteria of -.5 C Sea Surface Temperature anomaly in the East Central Pacific (ENSO 3.4) and it was short. As NOAA stated in its February 9, 2017 blog post, "This La Niña wasn’t exactly one for the record books." 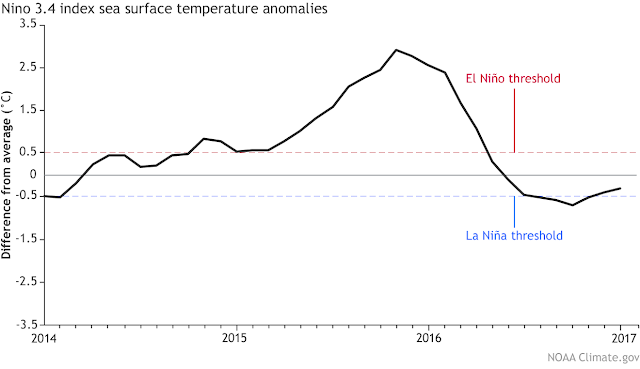 The La Nina was powered by below average subsurface temperatures of the central and eastern Pacific. However, that pool has begun to warm. What is forecasted next depends on who is doing the ENSO modeling. 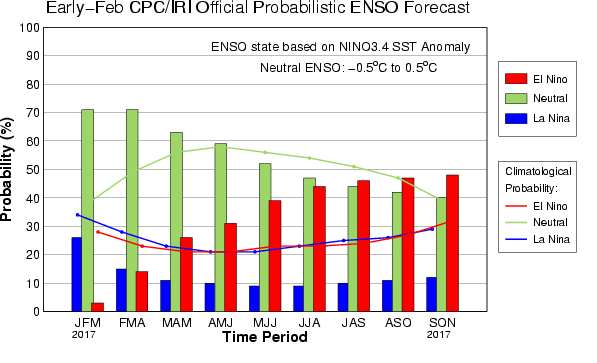 CPC/IRI is expecting ENSO neutral through the summer of 2017. 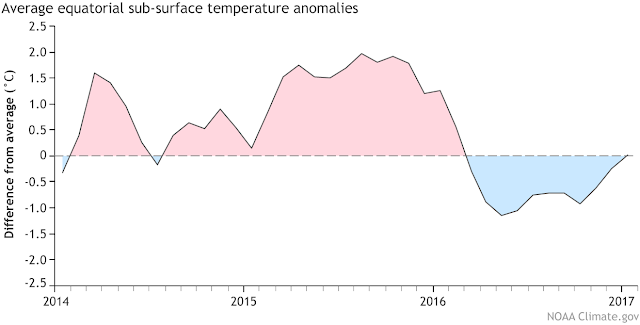 However, NOAA has stated, "The bottom line is that we’re giving the odds of developing El Niño conditions a slight edge for fall 2017, with the probability around 50%. The baseline chance of El Niño, La Niña, or neutral conditions occurring in the fall of any random year are about 33% each. Our current consensus forecast for the September—November 2017 period estimates a 12% chance of La Niña conditions, 40% chance of neutral conditions, and a 48% chance of El Niño." However it may be stronger sooner than the consensus assumes. 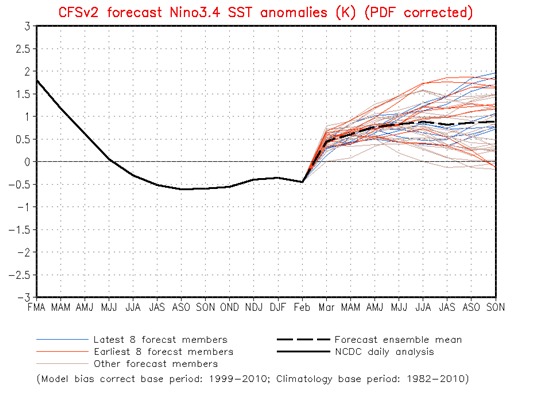 The CFSv2 Nino 3.4 forecast shows a quick jump into a minimal El Nino conditions by early summer, 2017. If it does occur, it will be another troubling impact on the global climate system suffering bouts of drought and flood enhanced by climate change.